Adonai Tz’va’ot: The Lord of “Hosts”? Anyone have a favorite translation for “Adonai Tzevaot” in the Kedushah? “Hosts” always makes me think of the person who takes you to a table at a restaurant. Holy, holy, holy is the God of heavenly forces. This made me really think about this peak moment of the service, and how it represents the fullness of God in three ways: as a force throughout the universe, as something not here but “up there” (mim’komo=”His place”), and specifically as God of Israeli (Elohayich tziyon). I think perhaps the important thing you are saying is that while ×¦Ö°×‘Ö¸××•Ö¹×ª (tz’va’ot, tzevaot) literally means “armies,” the reference is to forces of the universe being imagined as armies, as opposed to the human armies of nations. Note: The image above was drawn by Hannah and illustrates the page across from this passage in the Siddur. 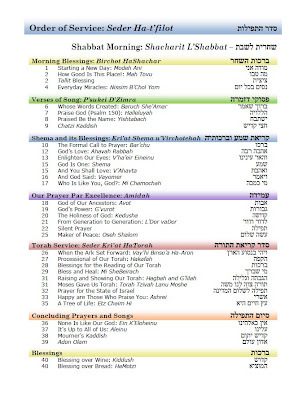 For the Family Service Siddur Iâ€™m editing, we set the Hebrew text in Times New Roman1 using Microsoft Word, because this was a volunteer project and we all had that software available, and because that font is actually quite nice at rendering Hebrew with vowels as needed for liturgy. The quamats2 that should be under the resh is under the kaf. Itâ€™s not a typo; I had typed the letters correctly: kaf , shva , resh , qamats , meteg . Itâ€™s worth noting that not all Hebrew fonts even include meteg, which is not used in modern Hebrew. Press ctrl-F9 to insert the special equation editor brackets. Note that the character used here is actually the Unicode MODIFIER LETTER LOW VERTICAL LINE character (hex 02CC), because Hebrew points without a consonant are rendered with a dotted circle by the software. I think this character is used as a phonetic symbol to indicate stress anyway, so itâ€™s not inappropriate. However, I consider this a work-around; in a perfect world, Iâ€™d like to have an accurate digital text that renders into print without pretending itâ€™s an equation. Hope someone finds this helpful or at least interesting! 1This would be version 5.01 of Times New Roman from Microsoft. Iâ€™m pretty sure the original 1930â€™s version of the font for the London Times didnâ€™t include Hebrew! 2I am not a not usually fan of the letter â€œqâ€ in Hebrew transliterations, but I am using the standard Unicode names of Hebrew characters. Seems we’ve been hearing a lot about tefillin lately: The plane diverted because they were a suspicious object. The World Wide Wrap and related events going on at synagogues. I recently participated in a mind-body medicine program at a major hospital. It’s given me new appreciation of the ritual, as tefillin connect prayer (mind, spirit) to the body and through that connection strengthen the experience of both. Specifically, the shel yad and shel rosh (hand and head tefillin), reflect body and mind. I learned in the mind-body medicine program that neurologically, achieving a higher level of awareness meant increasing the high-level activity in the prefrontal cortex (as opposed to the primitive brain stem) which is the area the shel rosh sits just on top of (and apparently the same area is significant in other spiritual tradtions). I bought my tefillin at the beginning of my semester in Israel in 1995. I’d been exposed to the practice as that summer as a counselor at Camp Ramah. My first roommate at Tel Aviv University, Steven, was a fellow American Jew who was a bit more advanced than I was in Israeli and Judaic knowledge. Eventually he used that knowledge to leave the dorm for an off-campus apartment but, first, we took a trip to Jerusalem together where he took me to a sort of tefillin factory in Mea Shearim and ordered me a pair. Mine are “smoli,” left-handed, and tied in the Ashkenazi manner; the sofer tied them and cut the outer plastic case to that specification at the time. They were one of if not the largest single purchase I made as a student that semester, costing around 900 shekels, which was around $300 at the time, if I recall. I think they are a bit larger that what you could buy in the States at that price which impresses people in some circles. My tefillin go on my right hand because I’m left handed. 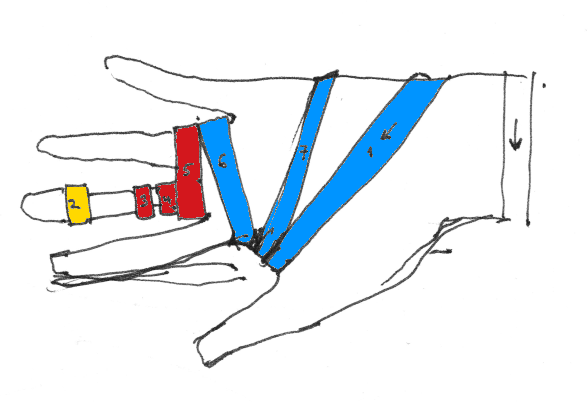 I drew this cheat sheet for wrapping shel yad on the hand, based on reversing the diagram in a book (possibly Aryeh Kaplan’s Tefillin) I found in the Hillel library back in college. 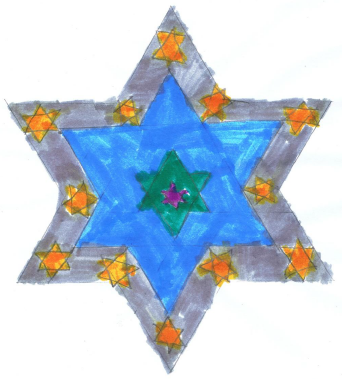 I’ve added color to show how it spells out the name of God Shaddai. I’m not sure I’m parsing the letters in an entirely traditional way here, but it looks right. While I never put them every day, after Hannah was born I did not use them for years. Largely because by the time I got children off to daycare or school I was late to work, but also because I’d heard from Orthodox sources that tefillin should be inspected regularly and putting on a pair that was no longer kosher was worse that wearing none at all. Then, about a year ago, my own Conservative rabbi held a tefillin “learners minyan.” I asked him about the need for inspection, and he said that we didn’t need to worry about it when in our community we just needed to get more people to use tefillin at all; and besides mine seems to be in better shape that others in our congregation. Tefillin still seem strange. I’m wired to my iPod and smartphone and it seems perfectly normal even though these were futuristic dreams a few years ago. Tefillin have been around for hundreds of years and I never lose the sense that they are foreign. Some people translate the word into English as “phylacteries,” which I think is an inside joke: is there anyone who does not know what “tefillin” means but knows what “phylacteries” are? I picture an ancient equivalent of Reform Jews coming up with a Greek word to make them seem more normal; they must have seemed foreign even then.